I recently met with a Chicago-area author for breakfast who was concerned that she was doing something wrong. This author had written a terrific book, designed the cover properly, promoted the book heavily, placed ads on Amazon, got reviews and consistently worked to sell her book to stores, libraries, online and to organizations. The book was not selling ENOUGH. All of those activities–and her book was still limping along in sales. When, she asked, and HOW were her sales going to allow her to make a living? Well, I had to tell her that her book sales would NEVER allow her to make a living. If history and reality were any indication, one non-fiction book (no matter how well written and powerful) is not enough to support an author. So what is the answer? Why do some authors get to make a living as writers and what separates them from the rest of the authors who do not? They diversify and create numerous avenues of writing income. See? Writing and promoting your book is just a piece of the puzzle. To truly succeed as a writer and as an author, you need more than one piece to successfully get that puzzle together. Fiction and nonfiction authors who make a living as writers do not do so on one book. The truth is, THIS author is not interested in writing a second book. At the moment, it is not in her plans, but she is still working towards her dream of quitting her day job. This author is turning everything around and creating a marketing and business plan that promotes her MESSAGE and herself as an expert. Speeches, workshops, consulting sessions…. Already she is making a great deal more BASED on her book. And guess what? Her book sales have gone through the roof. Talented authors all over the world are writing terrific books and promoting them properly and they are not selling. It is not the fault of the author or a problem with the book. It is just how reality works. I have heard a lot of talented singers in my day at local festivals. I have watched some terribly talented golfers consistently play fantastic games of golf. I have dozens of friends who paint beautiful pictures. None of THEM expect to make a living with THEIR talent. Those talented folks would be THRILLED to quit their day jobs and make a living with their talent, but very few of them are surprised when it does not happen. They are not shocked. Why are authors so consistently shocked when their first book does not generate an independent income? So let’s focus on using our talent and writing to make that full-time living we are all dreaming of. Did you mean “diversify”? Because divest means to walk away from something, and I think that’s not what you meant. Love the advice! I’m going to include this column in our weekly link roundup on Thursday. 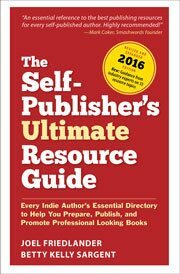 Amy, I don’t understand your advice at the end to “WRITE that NEXT book.” I see so many authors (you probably do too) writing that first book, publicizing it for a month or two after launch, getting discouraged by few book sales, then writing off the first book and diving into writing the second one. They should be spending at least the next six months doing the other things you suggested: promoting their expertise, getting onto the speaking circuit, etc. How does writing a second book help? What I meant was that authors should always be promoting AND always be writing. The key to success is not any one thing, but the key to failure often comes down to one thing. If you are not writing AND promoting, you are going to miss some important deadlines and success goals. If an author is not working on their next book, they will be “behind” on providing their readers with the next segment of the story (fiction)or the next important bits of advice (non-fiction) that their readers want. For those who say that they don’t have time to do both, I am FINE with that answer, but then they will not have the same level of success that authors who do. It does not mean that they will not be successful, it just means that they will not do AS well. When an author tells me that they want to quit their day job, I ask them if they are willing to CHANGE their day job…. successful authorship is more than a full-time job.